Classic Mini Cooper Hire in London for event companies, travel operators, advertising agencies and distinguished private travelers. Includes – Classic Car+Private Guide+Big Sights+The Perfect Intro To The City. Includes – Classic Car & Private Guide + Hotel Pick-Up + 1Hr + Hidden Gems + A Great Overview. Includes – Classic Car & Private Guide + Hotel Pick-up & Artisan Coffee + 2hr + Street Art & Markets + Half a day of serious fun. 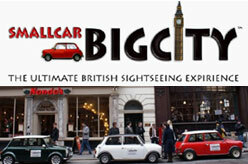 Includes – Classic Car & Private Guide + Pick-Up, Coffee, Lunch + 4Hr + History, War, Financial + A Ruddy Fantastic Day of London. London WC2N 5BY, England, United Kingdom.